Any time a new Hundred Oaks book comes out, I run to the bookstore. Miranda Kenneally's books are known for having nuanced characters, strong family relationships (and not just 2 parents, white picket fence families), and hot romance. Jesse's Girl is no exception. The book takes place over a relatively short amount of time. Most of it is about one day - the day Maya shadows Jesse for Career Day. Their relationship goes from nothing to a lot in that day. With Kenneally's skill as a writer, it doesn't feel like insta-love. Maya and Jesse both have trust issues. Jesse's is understandable. He's a world famous country star and is only 19. Girls throw themselves at him. Everyone throws themselves at him - but they always want something back. Maya isn't famous, but she's still been betrayed. She lost her virginity to her bandmate. Maya thought she meant something to him, but he quickly kicked her out of the band and started going out with her best girl friend. So both characters have walls to break through. The Shadow Day is a highlight of the book. Jesse starts off prickly, but he and Maya quickly make a connection and go off schedule. Jesse realizes that Maya is a talented guitarist and singer and pushes her to get beyond her stage-fright. Maya gets Jesse to lift a few of his barriers by treating him like a normal person and not asking anything of him. By the end of the day, they're jumping in fountains, running from police, and having a wonderful time. It felt like they were the best of friends even though they didn't know each other that well. Don't worry - the story isn't insta-love. Their relationship arc has its ups and downs after Shadow Day. For the most part, it's not that dramatic, but feels very realistic to their personalities and situations. And when their relationship is on the up, it gets steamy! There are both super-romantic and smexy times ahead. 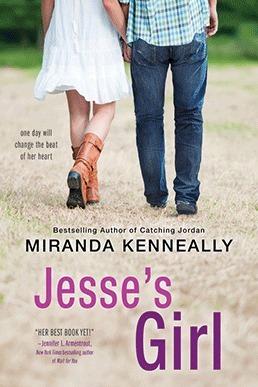 Like all Hundred Oaks books, Jesse's Girl incorporates characters from previous novels. Sam Henry and Jordan are the most prominently featured of the old guard. Maya is Sam's little sister. Catching Jordan is still probably my favorite book of this series, so I was thrilled to get so much more of their story. This is another solid hit in the Hundred Oaks series. It's probably not my favorite, but it does hit one of my favorite buttons - romances with famous people. It is a light and fun read. *Hundred Oaks books are companion stand-alones. I think it's more fun to start at the beginning, but you don't need to. Recommendation: Buy all of the Hundred Oaks books, including this one. I'm really happy you liked this one. I enjoyed every book in this series. I still need to read this one. It's on my nightstand right now. I have a few more reads to finish before it, but I'll definitely will read it soon. Great review! I also liked this one but not as much as every other book in the series. It felt a bit hollow after so many authentic books in the series. Yes to everything. I can't wait to read this book! I think Racing Savannah is my favourite of the series, but I'm still looking forward to this :) Great review!